A test run to the Beliatte station. Picture by SriLanka Railway Fan Club Association. The newly constructed Matara – Beliatta railway line will be vested in the public today (8) by Transport and Civil Aviation Minister Arjuna Ranatunga, the Transport and Civil Aviation Ministry said. The national ceremony will be held at the Beliatta Railway Station premises at 10.30 am under the theme Dakunu Lakata Aluth Magak (New Road to Southern Sri Lanka), after the inaugural run of the train which will commence from Matara Railway Station at the auspicious time of 9.00 am. In line with the national ceremony, four new main railway stations – Kekanadura, Bambarenda, Wewurukannala and Beliatta – and two sub-stations – Piladuwa and Weherahena – built on Matara Beliatta railway line, will also be opened by the Minister. On the 26.75km-long Matara – Beliatta line, seven trains are scheduled to run to and from Beliatta daily. Construction of the Matara – Beliatta railway line was carried out by China National Machinery Import and Export Corporation at a cost of US$ 278 million with funding from China Exim Bank. Both the longest and the second-longest railway bridges and the longest tunnel are on the Matara –Beliatta railway track. The longest, Watagama Bridge is 1,500 metres long, and the second-longest bridge, across the Nilwala Ganga, is 1,400 metres in length. The tunnel next to the Kekanadura Railway Station with a length of 2,017 feet is the longest tunnel in the country. The 300metre-long platform at Beliatta Railway Station is the longest in the country. 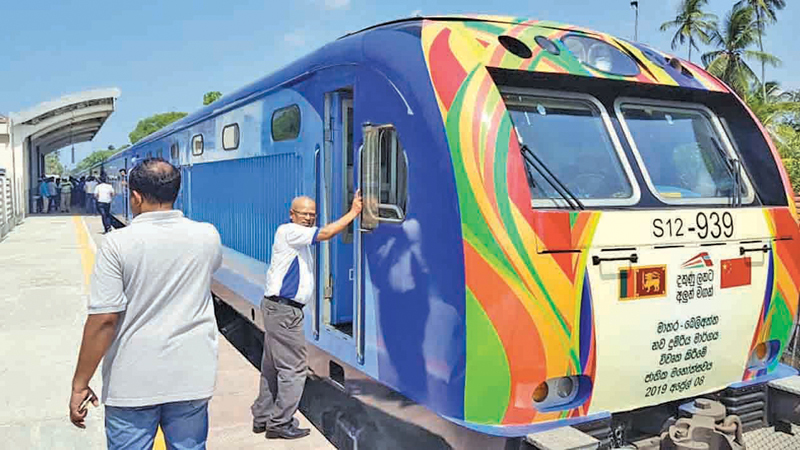 The 113-kilometre railway line from Matara to Kataragama is to be completed in three phases and the Matara to Beliatta segment is the first phase of the project. The first class fare from Beliatta to Matara is Rs. 120, the second class fare is Rs. 70 and the third class is Rs. 35, the Ministry said.